A very nice large building in town with Main Street frontage that is suitable for Office, Retail, or Service and is conveniently located in the main area of town. 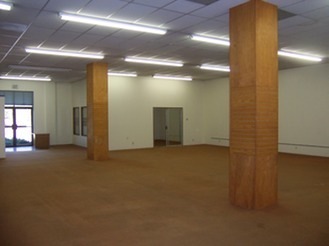 The building features a large open area with an office/retail type T-bar ceiling. There are three rooms that can be used for a variety of purposes such as office or meeting rooms. Additionally, there is a room with an insulated delivery door that would be suitable for shipping and receiving, or, the room could be remodeled with the delivery door replaced by glazing. Lots of parking with shade trees for parked cars in summer. Minimal low-maintenance landscaping that provides a nice impression. High visibility from South Main Street, a main arterial. 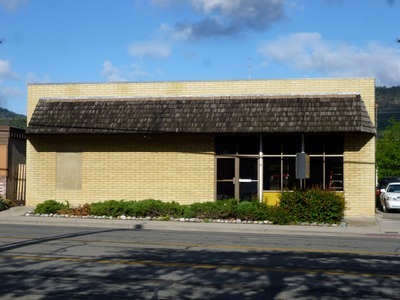 Possible uses depending on some amount of remodeling could be for retail, professional office (County Hospital is close by), warehouse shipping and receiving with a retail store front such as an outlet store, physical fitness center, or any number of other uses. Remodeling could be done during winter months. Solar Power Opportunity: There is tremendous opportunity to capture solar power from the 100-foot long roof that faces south. Note: the wood columns were for retail display and are removable. Inside is a 6-inch steel column.